Last major update issued on August 19, 2007 at 04:55 UTC. The geomagnetic field was quiet on August 18. Solar wind speed ranged between 343 and 431 km/s (average speed was 362 km/s, decreasing 59 km/s from the previous day). Solar flux measured at 20h UTC on 2.8 GHz was 67.9. The planetary A index was 4 (STAR Ap - based on the mean of three hour interval ap indices: 3.6). Three hour interval K indices: 20001112 (planetary), 20001000 (Boulder). At midnight the visible solar disk was spotless. The solar flare activity level was very low. No C class events were recorded during the day. 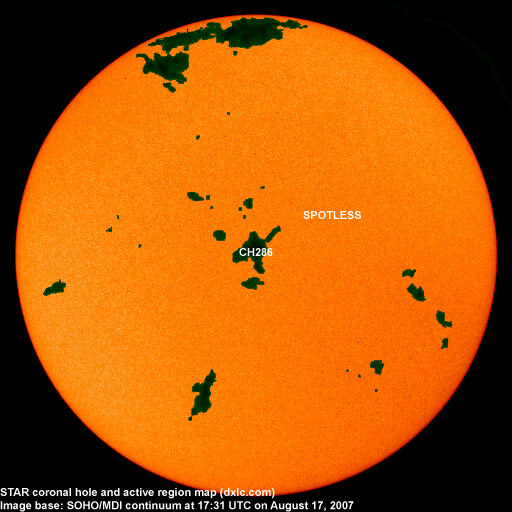 An active region at the southeast limb will likely rotate into view on August 19, this region could produce C flares. August 16-18: No obvious fully or partly Earth directed CMEs were observed. 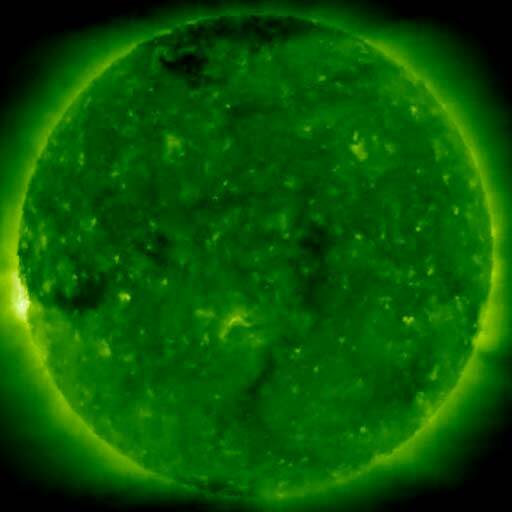 A trans equatorial coronal hole (CH285) was in an Earth facing position on August 14-15. A small recurrent coronal hole (CH286) was Earth facing on August 17. A recurrent coronal hole in the southern hemisphere will likely rotate into an Earth facing position on August 21-23. Processed STEREO 195 image at 22:05 UTC on August 18. The darkest areas on the solar disk are likely coronal holes. Long distance low and medium frequency (below 2 MHz) propagation along east-west paths over high and upper middle latitudes is fair to good. Propagation on long distance northeast-southwest paths is poor to very poor. Monitoring remarks from a location near N58E06: August 19: Many stations from North America were heard during the night. Greenland on 650 kHz was excellent (unusual this early in the season), as was 950 CKNB. Strong signals were heard from several other stations including 1010 WINS, 1030 WBZ, 1070 CBA, 1110 WBT and 1520 WWKB. Signals faded quicklier than expected after LSR. 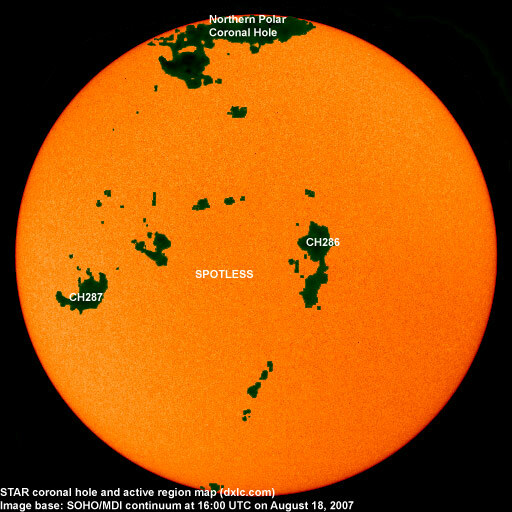 The geomagnetic field is expected to be quiet on August 19-21, possibly with a few unsettled intervals due to weak coronal hole effects.